Sony has announced a successor to its A77 A-mount interchangeable lens camera, which features a translucent mirror design. The follow-up to the original A77 features a new sensor, which is a 24.3 million pixel Exmor CMOS device, which has the same gapless on-chip lens structure as used in the A7R and the A6000. It now offers a greater sensitivity range of 100-25600 - 20% higher than its predecessor, which featured the same pixel count. 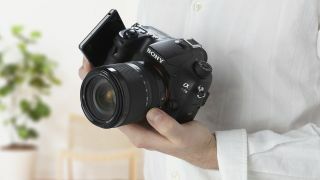 For the first time in an A Mount camera, Sony's latest generation Bionz X processor is included. It's claimed to be around three times faster than the previous Bionz engine. Sony says it has been optimized for the A77 II and employs detail reproduction, diffraction-reducing and area-specific noise reduction technologies. Also for the first time, is 79 autofocus points, including 15 cross points within the most frequently-used central area of the sensor. An electronic OLED Tru-Finder with a 2.36 million dot resolution is joined by a three inch, tilting TFT LCD screen. The camera features dust and moisture resistant seals around the main buttons and controls, along with protection around the media slot and terminals. Other interesting features include full HD video recording at 60p and 24p, and inbuilt wireless connectivity. This is the first A mount camera to be announced by the company since the Sony A58, an enthusiast DSLR which debuted in February last year. The Sony A77 II price will be £1,000 body only, or £1,550 with a 16-50mm f/3.5-5.6 lens.